Proper septic system maintenance is critical to help protect the water quality of a lake and will also help extend the life of the septic system. A septic system that is well maintained can last for 20 to 30 years. The main purpose of a septic system is to treat wastewater from your home (or small business). 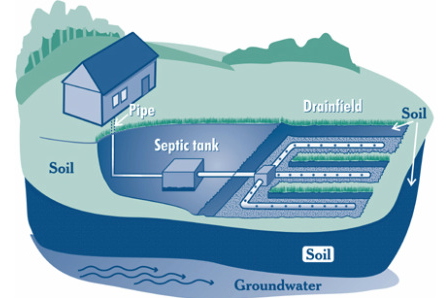 In New Hampshire, most septic systems include a septic tank and a leach field (or drainfield). All water that goes down a drain flows out to the septic tank through underground pipes. The heavier solids settle at the bottom of the tank and the lighter solids, such as grease and oil, float to the top of the tank. The remaining wastewater then leaves the tank through a series of pipes and disperses into the leach field. It is filtered through the soil, removing any harmful bacteria, and then eventually enters back into the system as groundwater. Why does a homeowner need to maintain their septic system? Proper maintenance helps extend the life of the septic system. If it’s not properly maintained, the system will fail and it will cost more in the long run to replace it. It helps increase the resale value of your house if regularly maintained. When a septic system is not working properly, untreated wastewater becomes a health hazard as seepage leaks into waterbodies. Additional nutrients also feed unwanted plant and algae growth in a lake or pond. Maintenance is inexpensive; replacement can be very costly. Have your tank inspected and pumped every 3-5 years by a septic service professional. Conserve water so you don’t overburden the system. Do not flush anything down the toilet other than toilet paper. Don’t put harsh chemicals, grease, paints, pharmaceuticals, etc., down the drain. They will harm the good bacteria that helps your septic system run properly. Don’t drive or run heavy machinery on the leach field because it can damage the system. Planting trees on the leach field can also have an adverse effect because the roots can interfere with the pipes of the septic system. Click here to download a printable copy of EPA’s “Protect Your Pipes” poster. Click here to download a printable copy of EPA’s “Think at the Sink” poster.